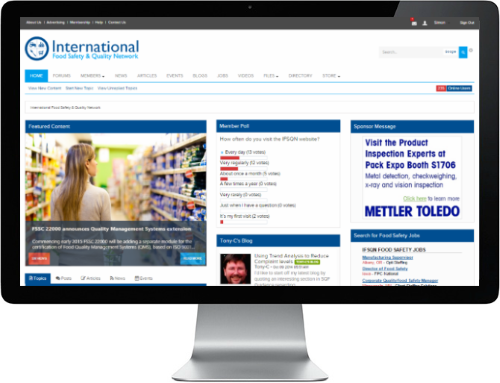 ​Welcome to the International Food Safety & Quality Network! IFSQN was founded in 2003 to provide food safety practitioners with an online platform to share knowledge and to enable collaboration on the implementation, operation and continual improvement of food safety management systems. Sixteen years on this remains our primary goal and as food safety regulations continue to develop and GFSI food safety certification standards become mandated globally the importance of IFSQN has never been greater. Our website attracts more than 4,000 unique visitors every day and we also distribute the popular Food Safety Talk newsletter to 25,000 subscribers each week. Our discussion forums are unique and unrivalled anywhere in the world; with over 70,000 members creating an archive of over 120,000 posts as well as 1’000’s of files to assist members old and new. Each year we run the popular Food Safety Live online conference bringing together thousands of food safety practitioners for a free day of learning and in January 2015 we began running free educational webinars through our Food Safety Fridays program. IFSQN is supported by advertising revenue, membership fees and the sale of relevant training courses and food safety management systems implementation packages for GFSI benchmarked standards including BRC, SQF, IFS and FSSC. The future will continue to bring fresh challenges for food safety practitioners and IFSQN aim to be your preferred choice for food safety and quality information and support.